For my first ever solo blog am I am going to talk about a collection that really stood out when I was looking around UCL in my first few weeks, and the interesting ‘science’ of phrenology. Phrenology is the study of head morphology and the belief that this is related to a person’s character. Simply put, the lumps and bumps on your head can indicate if you are (or are going to be) industrious or a criminal, a failure or success, a drunkard or teetotal. To many now this seems obviously absurd, and the theories behind it have been widely debunked, but in the 19th and early 20th centuries this was regarded as good science, and was very popular. One of the Teaching and Research collections cared for by UCL is the Galton Collection, named after Sir Francis Galton (see here for further details). Galton was well known in his time as (amongst other things) an explorer, a pioneer of meteorology, psychology and phrenology and a statistician. He is particularly remembered today for his work with fingerprints, and amongst the bundles of finger prints held in the collection are those of Prime Minister William Gladstone. 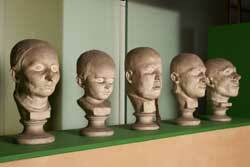 Linked to this collection is a set of plaster casts of heads, 30 in total, mostly mounted on plaster plinths. This collection dates from the mid 19th century and includes casts of men, women and children. They were collected by the German phrenologist Robert Noel between the years 1837 – 1845, and include casts of the heads of “poets and murderers, professors and highwaymen, child prodigies and medics.” They were collected from both the living and the dead. Noel and other phrenologists would most likely have used these collections to demonstrate their ideas, and would therefore have needed examples of different types of people. I can imagine it would have been reasonably easy to get a cast of one of the ‘good’ types of people, everyone loves a bit of flattery. However I would have thought it would be less so for one of the ‘bad’. Imagine being told that your head had just the right dimensions for a criminal, and then asked if a cast could be made so that others could see just how degenerate you are. A difficult sale. Thanks to the work of a previous curator, we know that Galton visited Noel in Dresden in 1843, and it seems likely he would have seen his collection. However the collection never actually belonged to him, and only came to UCL in 1911, after his death. They were donated to the Galton Institute by Mary Caroline Millbanke, the Countess of Lovelace, after her husband’s death. He was a cousin of Noel. The origins of this collection are particularly interesting because Lord Lovelace also had other family links worthy of note. His grandfather was Lord Byron, one of the most famous / notorious poets of the romantic movement, who was said to be ‘mad, bad and dangerous to know’. Lord Byron had only one (legitimate) child, who was called Ada. Ada Lovelace, as she became known after marriage, is today seen by many as the first computer programmer. This collection is a classic example of the worth of objects being enhanced by the story behind them, and one of the reasons why I enjoy working with museum collections so much. Not only is this an interesting collection of faces of people who lived 160 years ago, but also its related to one of the most famous poets of Georgian England and a computer pioneer. It is links like these that can enhance the already existing historical and artistic meaning of objects, and add a new layer of meaning that link them to computer science, English literature, woman’s rights, Greek patriotism, etc etc. It’s the story that brings the object to life, and the object that links us today to the story. when I was at the Slade in the late 70’s, early 80s, I had a lot of access to the Noel collection. It was stored in Lawrence Gowing’s studio! (Principal of the Slade) I was his assistant at the time. I used to regularly dust the heads. No one cared for them at the time. I have a few stories around them!!! Very interesting! We would love to talk to you about this, can you email me on nicholas.booth@ucl.ac.uk?